-300th supporter on January 7th, 2014! Help me get to 500! -250th supporter on November 5th, 2013! help me bring it up to 300! Photos have been updated to reflect finished landscaping, and redesigned interior stairs as of December 31st, 2013. First, please DO NOT BE PUT OFF BY THE PINK! 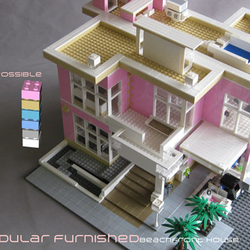 I have proposed many alternate colours, as it is my intention to make this house as flexibly integrative as possible with all types of Lego scenarios (see possible colours above). 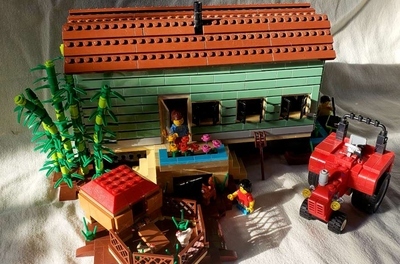 The concept of this Lego House was inspired by a combination of the Monster Fighters Haunted House, Lego Friends, Lego Creator and Lego Architecture lines. I wanted to create a house that was “play-friendly”, but in a style of California Mid Century Modern Architecture. For those who do not prefer “pink”, I have included OTHER POSSIBLE COLOURS: classic white, brick yellow, medium azur, medium blue or light grey --- as some suggestions --- (see possible colours in photo above). This project proposal includes original furniture and house fixture designs, which reflect the Mid Century Modern esthetic. I designed most of its contents, however, some Friends items have been altered. It has 2 floors, and is hinged, so it can open in half for access and play. The majority of the roof is also removable, on both halves, again, making the interior (a bedroom, living room, kitchen, dining room, workshop, bathroom, office/craft room) more accessible (see photos below). Innovatively, when the two halves are closed, the interior stairs from the ground to the second floor become framed by low walls, complementing the modern architectural concept of defining interior spaces with walls of varied heights. This feature and its interior rooms are illustrated in more detailed photos at Flickr. I designed this house with the intention of integrating it into multiple Lego product lines, making it appealing to a broad audience from kids to adult Lego fans. 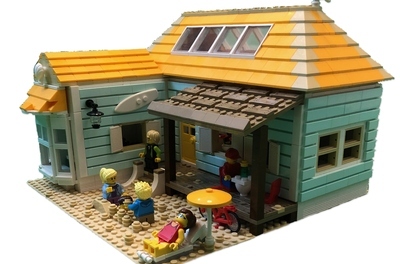 Also, unlike the current Lego Olivia’s House in Friends, this one is more modular, and unlike past house and beach house sets, this one is substantially more modern and a departure from the stereotypical sloped roof, accommodating an additional large interactive area. Again, DON'T BE TURNED OFF BY THE PINK! 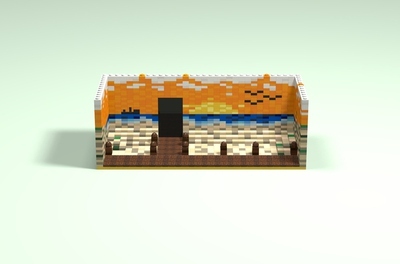 My basic premise is to see it in a girls room, to non-girlish rooms (Lego does make gender neutral houses), to adult collections standing alone, or placed among other buildings, or elaborate city landscape settings, or an architect's office as decor, or decor for any other environment. 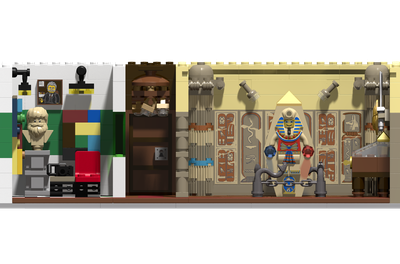 My house can also interest a person who has no background with Lego but instead, admires art, crafts, sculpture, and in general, miniatures! so its a wide range. Update: redesigned stairs for added stability and realism. Rear of House, ground level: finished fountain, dog house, barbeque, and seating area with modern fire pit. Backyard patio with modern furniture, firepit and barbeque. Removable roof in 3 sections for ease of access and playability.